“We need young people to speak our faith. 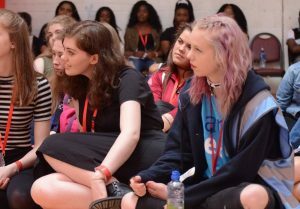 The Church is built upon young people,” Archbishop Charles Brown told around a thousand young people at the concluding mass of this year’s Youth 2000 Summer Festival on Sunday. 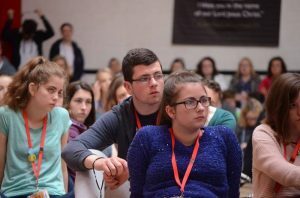 Referring to the Gospel passage where Jesus says everything hidden will be revealed, Archbishop Brown said the Lord was working secret miracles in the hearts of the young people at the Roscrea festival. 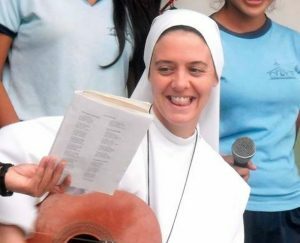 Faith too has an element of secrecy, the papal nuncio explained. “Faith is believing in something that we can’t see, something not totally verifiable.” Think of how many people saw Jesus walking the streets of Nazareth, he said, and didn’t see anything special at all. 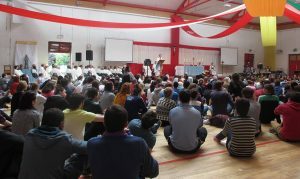 Archbishop Brown encouraged the young people to witness to their faith – proclaim it from the housetops. “Don’t be afraid to pray, don’t be afraid to show your faith in this world,” he encouraged the young people. He then placed before them three young people who had done this – Therese of the Child Jesus who entered a convent when she was 13 years old; the 17 year old St Joan of Arc who led the French forces in battle and Charles de Foucauld who as a young man lived “a completely debauched life, filling his life with all the things that he thought would make him happy but actually made him miserable”. Charles de Foucauld’s cousin noting how unhappy he was suggested he speak to a priest to find out about the Catholic religion, but instead the priest (who was hearing confessions) told Charles to kneel down and make his confession and “he rose up a different man”. Charles de Foucauld ultimately became a Trappist monk and died in North Africa as a hermit taking care of the poor and abandoned, murdered by marauders.